As part of continuing efforts to see that everyone has access to our legal systems, the Department of Justice and Constitutional Development has extended some services to rural and township courts. These changes will ensure the availability of more services that are presently found in district and magistrate's courts. As of August last year, the services offered by the lower courts (district and magisterial courts) were increased. The new extended services allow the lower courts to have the status of other courts. These include access to civil and family law services in addition to hearing criminal matters. 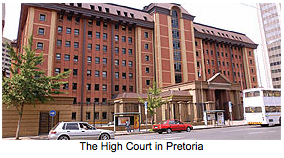 The changes will see some of the rural and township courts also hearing maintenance matters. This will make life easier for those applying for maintenance orders since they won't have to travel long distances to courts situated in large towns for their applications to be seen to. In addition to this, government is also looking at other methods that will help strengthen the small claims courts. Some of the new methods will include addressing problems faced by the small claims courts. These problems include a shortage of staff, as well as insufficient security and training. The Department of Justice and Constitutional Development is also looking at increasing the number of small claims court commissioners. In addition, the department will look at ways to reduce the time it takes to carry out orders or rulings of the small claims courts. To strengthen government's efforts in the fight against crime, the department has proposed changes that will allow police to use fingerprints stored by other government departments such as the Department of Home Affairs. These changes will allow the South African Police Service to check these fingerprints for criminal investigation purposes. To speed up the hearing of cases, the Department of Justice and Constitutional Development started a project to decrease the number of cases that are yet to be heard in regional courts. The project resulted in the appointment of magistrates, prosecutors, legal representatives and support staff to the regional court sites with the most backlog cases (longer than nine months on the court rolls). By the end of March 2009, a total of 13 113 cases have been permanently removed from the regional court rolls as a result of the project. This included 8 855 cases that were finalised, as well as 3 649 cases which were withdrawn after reviewing of regional cases at backlog sites. The remaining 609 cases were transferred to other courts.